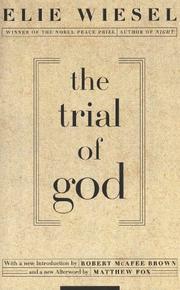 Inside "the kingdom of night"--the concentration camp--Wiesel actually witnessed a trial which put God up as the accused, charged with being either accepting of or blind to the murder of HIS chosen people. Now he's made it into a dramatic parable, set in 1649 in a Russian village that's just undergone a pogrom. Only two Jews remain, an innkeeper and his violated daughter. When roving minstrels arrive by accident at the devastated town and offer to put on a Purim play, the innkeeper suggests they hold a trial instead. "I want to understand why He is giving the killers the strength and the victims the tears and the shame of helplessness. . . . Listen: either He is responsible or He is not. If He is, let's judge Him; if He is not, let Him stop judging us." A stranger, clearly Satan, arrives to serve as defense attorney. The argument he puts forward is essentially that the kingdom of death is God's to add to as he wishes; His miracle is to allow even one Jew to survive as testimony--and one always does survive. The kernel, then, is arresting; but the dialogue is stir and lifeless, and two of the three acts seem long prologues and little else. Finding a shape for the ultimate seriousness that infuses his thought remains Wiesel's thorn; his success here again is only intermittent.